The China Corporate United Pavilion (CCUP) will display the painting "Chinese Ray of Colour" by Francesco Zavattari in its Expo 2015 pavilion. The piece was produced by Zavattari during the "Live Painting Performance", coordinated by Andrea Scarfi, held Tuesday, March 10 at Piazza Duomo in Milan. The Italian artist personally presented the work to Mr Wang Hui, Vice-Chairman of CCUP, as a tribute to reinforce the rapport of esteem and collaboration with China, a rapport destined to continue with new, important shared projects. 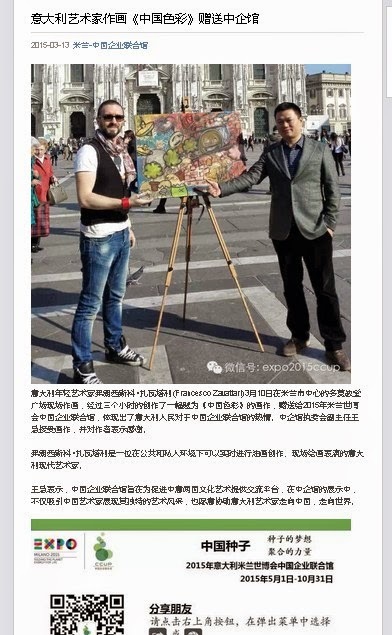 Photo: Zavattari presents his painting to Mr Wang Hui at Piazza Duomo in Milan. The official communication published by the CCUP to its profile on "Weixin", the most popular microblogging platform in China.